Lead Generation Archives - Go Creative Go! http://www.gocreativego.com/wp-content/uploads/2016/01/GCG-pinnable-killer-content.jpg 1080 735 Mallie Hart http://www.gocreativego.com/wp-content/uploads/2016/07/GCG-sitelogo-new.png Mallie Hart2016-01-20 07:38:412016-08-22 16:30:44Killer Content Marketing Creates Opportunity! Consultation Call Courtesy: If You Schedule, Answer! If we schedule it … we will call. Of course, after we schedule it, we’ll confirm it. If we confirm it … we will call. 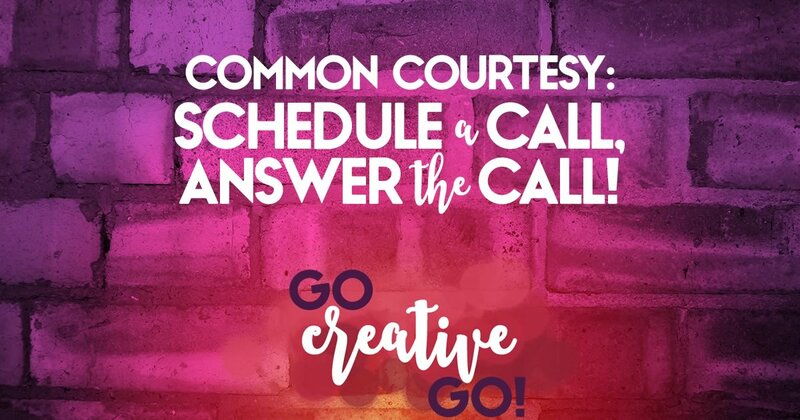 If we schedule, confirm and call … and you don’t answer? Well, it’s a given that we’ll call you really bad names, privately of course, and then carefully reconsider your value as a prospective lead and/or client! No, I’m not involved in some ridiculous scam where if you pick up the call I’m somehow going to swindle you out of a squijillion dollars. That call? It’s not so free for me, the one making the call. Why not? I’ve taken the time to add you to my CRM as a lead. A very soft lead, of course, but your affirmative answer has led me to believe that you have some interest in me, if not in my product or service. I’ve also added the call to my calendar, with you invited, and set up various reminder notifications. I’ve also crafted a follow-up email to make sure we are still on for the call. Finally, because it’s important for me to understand you in order to understand how I might be of value to you, I spend a lot of time on research. Researching you, your company, your current clients, your staff and more. I go to Google, peruse your Pinterest boards, tip-toe through your Tweets and more. Depending on how active you are online this can take fifteen minutes, or it can take over an hour. While my pre-call time investment might not be that heavy, I’ve also cleared a block of time for our call. Whether I’ve allotted you fifteen minute or an hour, I can’t give that time slot to someone else. If you’d done the right thing and canceled the call when I sent the initial confirmation, I could have given that time slot to an actual interested party. Maybe I could have slept in a few extra minutes that morning after a long night prepping (are you feeling guilty yet?). BUT, I had an emergency! Sure, we know these things happen. Kids get sick. The dog ate a pound of baking chocolate. You somehow managed to fill your car with diesel rather than unleaded (funny story – my mom actually did this way back in the day). But, in the instance of an emergency, you can and should reach out and make some amends after the missed call. I can’t tell you how many prospects, some people we’ve known for quite some time online, simply ignore our outreach after the missed call. You can and should say no if you’re not interested. We’re big boys and girls and we are well aware that selling, even a free consultation, is going to result in a LOT of no responses. If you don’t have the time or the inclination to take the call, don’t let me schedule the call. Time, energy and effort ARE our money, too. Wasting it with an offhand yes to a consultation call doesn’t make you look good. How do you proceed after a prospect, client or friend fails to pick up when you’ve scheduled a call. We’d love to know! 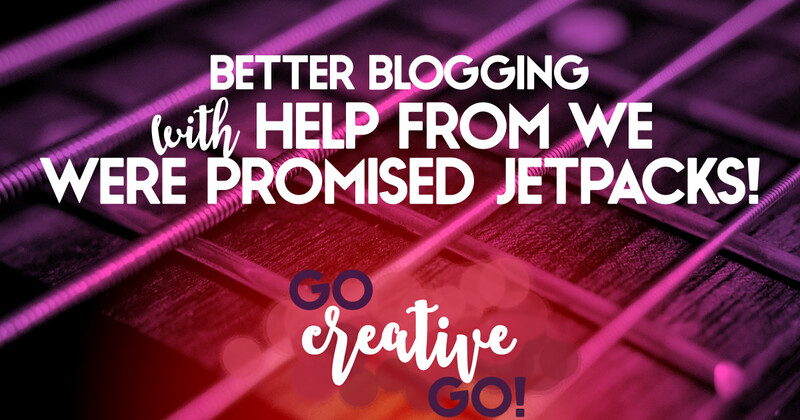 http://www.gocreativego.com/wp-content/uploads/2014/12/GCG-pinnable-answer-call.jpg 1080 735 Mallie Hart http://www.gocreativego.com/wp-content/uploads/2016/07/GCG-sitelogo-new.png Mallie Hart2014-12-17 07:40:402016-10-13 12:54:26Consultation Call Courtesy: If You Schedule, Answer! Benefits Of Creating Content: 5 Reasons To Get Busy! You hear it over and over again. Content is KING. Content is the key to increase reach and make impressions. But you’re still waffling about blogging – or creating other types of content, like videos, images or even podcasts. You just can’t seem to make the time to create content on a regular basis. Why? 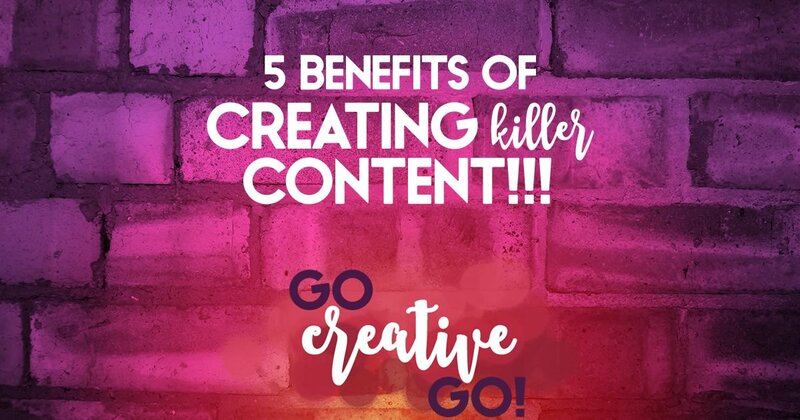 Here’s hoping that one, or more, of these five content creation benefits will sway you to add creating content to your busy schedule! 1. Unique content (what you write, record or design – rather than what you share) gets visits to YOUR site. Your website! The hub and hallmark of your digital real estate. And visits to your site might lead to someone taking action (you know, via a Call to Action), which just might land you a prospect or solid lead! 2. You want people to add themselves to your lists, right? Of course. Your list is something you own and it won’t go away unless you do something really stupid. But, in order to get them on your list, you have to – YES – get them to your site. Content you’ve created is a big draw when it comes to creating clicks that land eyes on your site. If the content you’ve created is compelling, they’ll want to see more. This just might prompt site visitors to sign up for regular updates. 3. Social media shares generally don’t get as much reach and response as unique content, be it an image or a link to an article or video. Social media marketing and smart sharing is valuable to your overall marketing efforts. Creating content for your social media platforms, content that drives prospects back to your site, your calls to action and your list building efforts is crucial. Even Twitter allows for visuals and video. 4. Content creates conversations. Taking a stand on an issue, sharing your unique perspective or taking on the devil’s advocate role can create a conversation or discussion. Discussions and the further sharing of ideas can often spark interest in other things you have to say and share. What’s influence? It’s that special something that comes when the content you share strikes a chord, is highly valuable and generates trust. Sharing the content of others is great, and shows you’re generous and on top of your industry. But creating content that inspires is one of the best ways to gain an influential position and credibility in your target market. http://www.gocreativego.com/wp-content/uploads/2014/12/GCG-pinnable-5-benefits.jpg 1080 735 Mallie Hart http://www.gocreativego.com/wp-content/uploads/2016/07/GCG-sitelogo-new.png Mallie Hart2014-12-15 08:29:362016-10-13 13:21:40Benefits Of Creating Content: 5 Reasons To Get Busy! You recently sent me an email describing yourself as the digital marketing and SEO expert at a leading SEO service provider. I’m writing back, in the form of a blog post, questioning the idea that you work for a reputable and, thus, leading agency. Why am I questioning the authenticity of your expertise, the expertise of your agency? 1. Your email was delivered via Gmail address. Don’t get me wrong, I’m a Google gal and I love me some Gmail. However, even though I’m a devotee, I manage to write and respond with an email that showcases the domain of my company, Go Creative Go. Kudos for using Gmail and not Yahoo or AOL. Still? The failure to write me from a domain leads me to think your ‘leading” provider status might live only in your own mind. 2. No link to your site, EVER! Jay, I’m shaking my head in wonder. You never, not once, link to your site. Therefore, I have no way of visiting your website and no way to verify your leading provider status. I can’t check where your site ranks in the SERPs, as you never share where exactly your company resides online. What gives? Just saying, Jay – any SEO company worth their salt has a smart presence online. Know what else? They share it with their prospects! 3. You promised me first page rank on Google, Yahoo and Bing. If there’s one thing I know, and one thing that I’m sure ALL of my audience knows, it’s this: No reputable SEO company promises first page rankings. Why? Because there’s no way to guarantee delivery. You didn’t ask me which keywords or key phrases I’d like to be found under, so how can you guarantee success? 4. You called my links poor and unauthorized. Since I pick and choose any sites to which I link quite carefully, and because I carefully monitor sites linking to me, I’m going to have to call you out on this charge, Jay. I may not be the SEO expert you claim to be, but as a web designer I take a very hands on approach with all parts of my website, including the links going out and coming in. So, sadly, going to have to channel Dr. Sheldon Cooper and call out your email’s assertion as pure hokum! First of all, ouch! I generally don’t appreciate constructive criticism from those sending me an unasked for sales pitch. Secondly, I rarely take content marketing or writing advice from people who can’t manage to create a grammatically correct sentence. That’s right! Don’t diss my content when your writing leaves a little something something to be desired! 6. You tried to convince me your spam email is NOT, in fact, spam! You ended your leading SEO service provider sales pitch by telling me you’re NOT spamming me. I think we’re going to have to agree to disagree on what spamming actually entails. Disclaimer:- “Note: – We are not spammer. We found your email through manually efforts.We are sorry if you get email 2 or 3 times.You can simply reply with “remove” so we will delete your email from our list.Thanks again.“The CAN-SPAM Act of 2003”. I don’t know you from Adam, and I certainly never signed up for your list. So, asking me to remove myself from something to which I’ve never subscribed pretty much points the finger at you as the spammer! Sending me the same unsolicited email more than once, two-three times, screams spam! You say you’ll delete me from your list. A list I never asked to join. Once again, this screams out spam, Jay. You either scraped my email address off my site after a keyword search OR bought my email address from a less than credible source. Final time I’ll say it, SPAMtastic! And, in closing, what the heck are “manually efforts” and why would you think that gives you permission? Jay, I’m really sorry to say that I seriously doubt you’re a leading expert in anything related to SEO. In fact, I believe your only expertise lies in less than stellar spam email tactics. Going to have to give your offer a pass. Anyone else heard from Jay or his ilk of late? Have you ever responded to spamtastic email with a blog post? If so, I’d love to read it. Please do leave me a link in the comments.